Orthodox Jewish Wedding online guide for the perplexed. 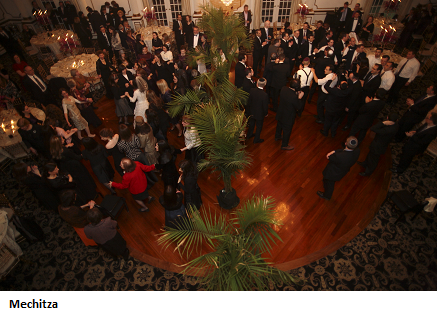 For Jews planning a wedding and want to do it the Orthodox Jewish way (at a reduced price), this blog is dedicated to you. Some decisions that you’ll have to make with your wedding florist can be scary. 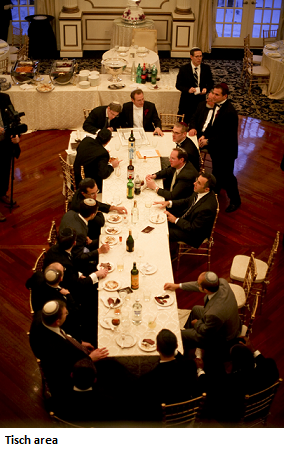 For one, the financial responsibility for paying for the Florist in a Jewish Wedding is typically provided by the groom (see FLOP and groom’s financial responsibilities). This means you’ll have to work with your hubby-to-be on setting the price point. While my vision for wedding flowers and decorations including hiring a high-end highly rated Manhattan Florist, my fiances vision was to spend as little as possible. He even looked into organizations that donate flowers for weddings. I’m not saying there is anything wrong with working with donated flowers for a wedding, as it does cut considerable costs (if interested, look into The Enchanted Florist at Allegro School). Nonetheless, we did find a middle-ground but it did take some work to be able to keep my vision and at a reasonable price. The high-end highly rated Manhattan Florist was willing to negotiate down to $8,000 but my fiance was determined to find a reputable florist that would cost half that price. His determination paid off, literally, and we ended up spending $3,500 for all of the bells and whistles that I dreamed of having at my wedding. How did we make it happen? o Front Entrance Awning: Decorate the entrance with some greenery, flowers, ice sculptures or lanterns. 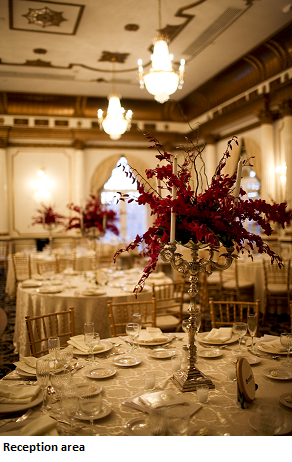 o Front Entrance Table with Name Cards: Use a signature tree or flowers that drape. o Tisch Area: The tisch area should be spacious enough to accommodate for the several honored family members and / or guests participating in signing and plate breaking. 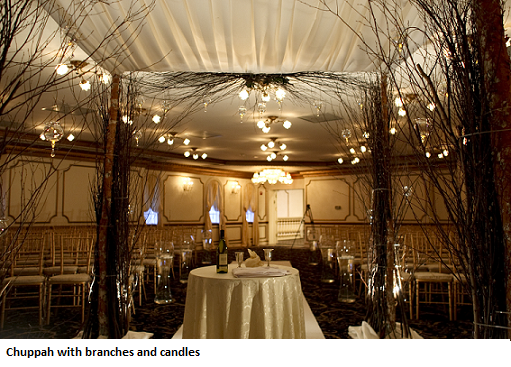 o Ceremony Aisle: Simple decorations for the aisle express elegance while leaving the spotlight on you. o Chuppah: The idea is to use branches, candles, and lighting...with little to no flowers. 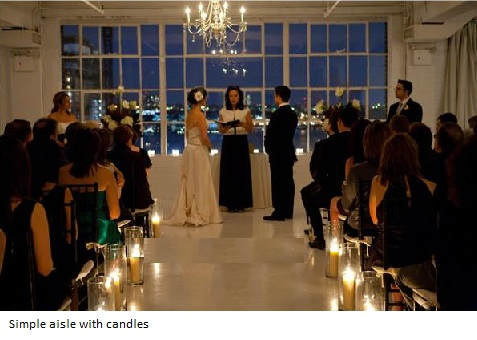 This sets a romantic tone without hiking up costs. 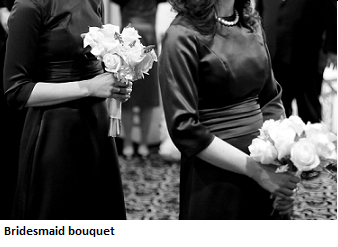 o Bride's Bouquet: Smaller versions of the same arrangement can significantly cut costs while still providing the added beauty. o Bridesmaid Bouquet: Similar to the bride's bouquet, the bridesmaid bouquet does not need to be elaborate to make a statement. o Reception Tables: Some venues may have on-hand vases or centerpieces they are willing to lend you at no additional cost. Ask the venue to show you pictures of previous weddings that used their centerpieces to get inspired by ideas on how to transition them into your favorite look. o Boutonnieres: These will typically be the less costly of flower-related purchases. To further reduce costs, consider flowerless boutonnieres. o Bedeken: The most beautiful “piece” to the bedeken is the bride and the draping of the dress on the chair. That being said, elaborate decorations of flowers are not necessary to create an elaborate feel. o Mechitza: Most secular florists may not be well-versed in Mechitza options. Further, they may not even have a recommended rental place for this. The easiest way to simplify things is to go with a florist that typically throws Orthodox Jewish Weddings. o Tip: Bring pictures of the wedding venue to give the florist an idea of the colors that already exist at the venue and to ensure the flowers won’t clash. Get Inspired: If you’re the kind of person that has not always had a vision of how you want your wedding decorated, the least costly first step is to look at wedding magazines and start cutting out pictures you find most inspiring. Eventually, you may find that you will start to gravitate to certain types of flowers or colors, and this will help build your vision. Be sure to keep the pictures of the ideas you like most so you can easily refer to them when expressing what you like to your florist. Leverage the Free Stuff: That’s right, I said “free”. Yes, unbelievably some of the wedding vendors that you are using will lend you items that you do not have to spend a dime on. For instance, the wedding venue I used was kind enough to provide us with candelabras that were used as the centerpieces for the tables at no additional cost. Embrace Minimalism: Sometimes the best (and most cost efficient) way to decorate is to think like a minimalist. Big is not always better when deciding on flowers. Even Kate Middleton chose a smaller size bouquet than expected, and this only put more focus on her gorgeous gown. The chuppah does not need a tremendous amount of flowers to get the “bling” effect (check out pictures of chuppah’s with little to no flowers). Branches, candles, flower petals, and different shapes and sizes of glasses or vases can help reduce the number of flowers needed to enhance the atmosphere. 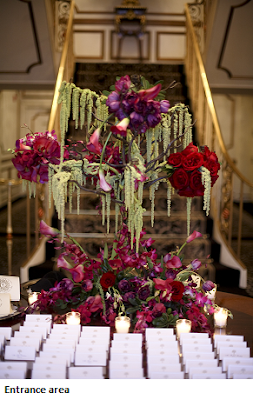 Get the “Best” Ideas: Admittedly, the experience at the high-end florist took my vision to the next level, as they offered outrageously exquisite ideas and while we did not end up going with them, they showed the best of the best. This exposure helped see what would be worth passing up versus what would be worth “fighting” for. 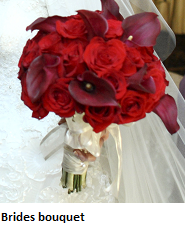 Solidify your Vision with your Florist: For each piece that you have gone through with your florist, make sure you are happy with the quality of what they will be providing by physically having them create the samples that will be used and going to their grounds to test it out and explore other options they offer. Reputation is Key: While I did my research to find the “best” florist on the internet and was driven by reviews from several wedding sites, my fiance did his research by hearsay which turned out to be not only the most affordable choice, but a great choice with spectacular results. The florist he chose was from the depths of Brooklyn, a Haredi woman, and when I tried to find anything on the internet about her I found absolutely nothing. I was nervous and even more so when we traveled to Brooklyn into a very religious neighborhood and found what seemed to be a ghetto work space where she provided samples. After having already experienced the high-end Manhattan florist, I initially shunned the idea of using her. But a second thought, and with the consideration of price, we walked through our requirements of what we wanted for the wedding and she said she could do it all. I believed in her mainly because my fiances contacts acclaimed the quality of her services and for the ease in speaking to her about ideas on decorating religious-related staples such as the bedeken, chuppah and mechitza. This was second-nature to this religious Jewish woman whose business was booming not because she marketed herself but because she earned a well-deserved reputation within a community that extended beyond the boroughs. Sometimes hearsay on reputation pays off, and more importantly, working with a florist that is an expert on throwing Orthodox Jewish Weddings makes life a bit easier when planning a wedding. As a Filipina it's interesting to learn that Ketubah is like a marriage of love and fine art wherein every detail can be a symbol that has its own meaning. Because of its ancient and venerable history, custom Ketubah has its place as an important form of Jewish ceremonial art throughout time. Yes, the Ketubah is considered the Jewish version of a wedding contract. Ketubah's can be quite beautiful and it is typical to find them framed on the wall. I was quite picky in my ketubah search but fell in love with ketubah's designed by Danny Azoulay. His 'Leaves of Love' is my favorite! Check it out. For my brother wedding ceremony, I was just looking for ideal Wedding venues in NYC. Please suggest and give some results on weddings event location.